Grand Theft Auto: San Andreas, places the player in the shoes of one Carl Johnson, a Grove Street gang member who has finally returned home to the gang infested city of Los Santos after his mother is gunned down in a random attack by rival gang members. Intercepted by the brutal and corrupt members of CRASH (wonderfully voiced by Sean Penn and Samuel L. Jackson), CJ must fight for his life to defend all that he holds dear in a city that simply seethes with hatred and violence. For those of us who were concerned that Grand Theft Auto: San Andreas was nothing more than Vice City with more rap music, nothing could be further from the truth and the level of gameplay and game features that Grand Theft Auto: San Andreas includes is nothing short of remarkable. In addition to all of the staple side missions of the series, including the likes of paramedic, vigilante and fire-fighter, there are other, hidden missions as well. Fancy being a drug dealing courier, or trying to beat some random high score from a biking champ? What about taking over as a teamster for a day, and trucking all over the state of San Andreas? Grand Theft Auto: San Andreas is without a doubt, the largest GTA to be released to date, easily four times the size in terms of physical dimensions and content as its predecessors. 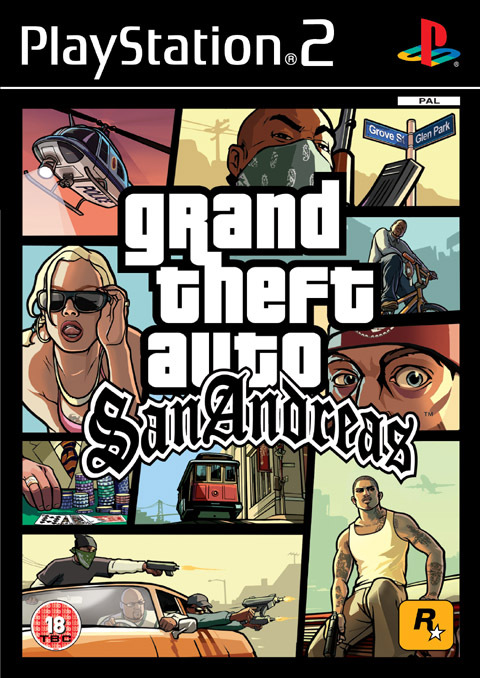 Whereas the other two games featured one city with additional parts of the map that would unlock and become available after the plot had advanced, Grand Theft Auto: San Andreas provides a total of three cities. The inclusion of three cities and ensuring that they are all highly unique with their own personality and culture is truly a sight to behold, and that is precisely what Rockstar have managed to do. Check out the steep hills, grassy terrain and trams of San Fierro, the Latino and Black gang infested city of Los Santos, or the casinos that feature so prominently in Las Venturas. Even more impressive is the fact that the three cities are not mere transport hubs or footnotes on the map but rather, provide their own missions and issues. Specifically, each different city provides the player with the opportunity to seek out and collect different collectible items ranging from spraying gang tags in Los Santos, to taking photographs of landmarks in San Fierro. One notable difference between Grand Theft Auto: San Andreas and its immediate predecessor, Vice City, is that in Grand Theft Auto: San Andreas the player will typically only be able to purchase safe houses as property rather than money making businesses. In addition, money is rather tough to come by for the player unless they are prepared to make use of the various side missions which are featured, and so this can pose a challenge in the beginning when the player needs additional firepower. 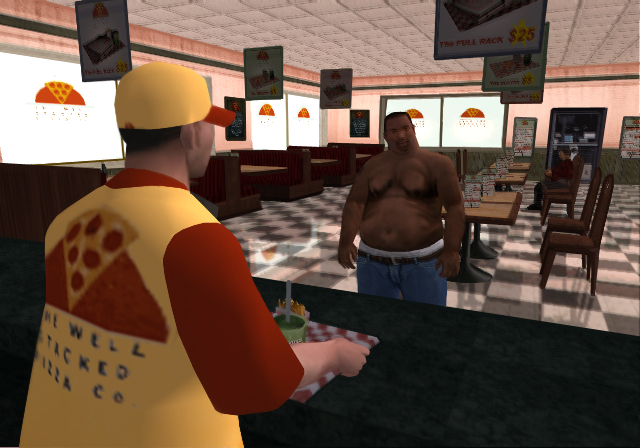 Grand Theft Auto: San Andreas also introduces a rather interesting new quirk into the gameplay, some RPG elements. Specifically, the player will be able to boost various in game stats such as their accuracy and proficiency with different weapons, as well as their ability to fight more effectively in hand to hand combat. CJ also needs to ensure that he eats, otherwise he will continually lose health until he does. However, if the player should force CJ to eat too much then CJ will become bloated and a massive mound of quivering flab and blubber and so CJ will struggle to do much in the way of running or climbing. 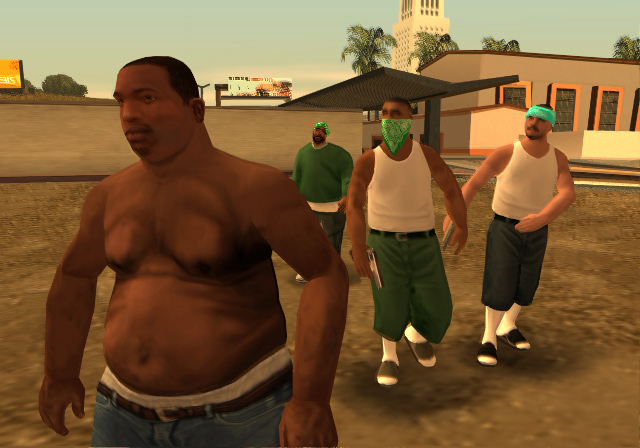 By far, Grand Theft Auto: San Andreas is one of the best in the series.